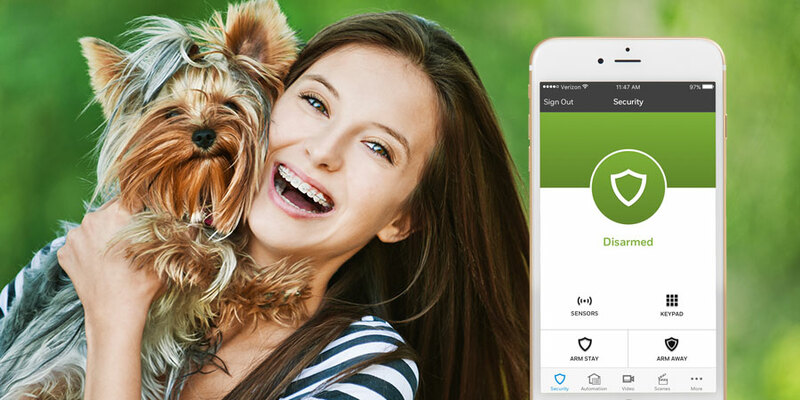 Smart home security systems are designed to help protect every member of your family, and that includes the four-legged members. That’s right, we’re talking about pets; here are some ways they can be safer thanks to your smart home security system. If you’re like many busy homeowners, there’s not always time to walk your dog. Maybe you’ve decided to try out a dog walking app to take care of the job for you, or hired a neighbor who is already familiar with your pet. No matter who you hire, you need a secure way to let them in the house that doesn’t take up much of your time. If your system includes a smart lock for the front door, this can be the perfect solution. When you get the alert that your dog walker is ringing the doorbell, swipe on your phone to see them on video. Next, a simple tap on your phone can command your smart lock to let them in the house. When they walk out, lock the door again until they return – at which point you can unlock it until your doggie is safely inside. If there’s a doorbell camera, thank your dog walker through the two-way voice speaker. All of this can be done while you’re at work, on vacation or wherever you need to be – and your pet stays safer because of it. Speaking of pets staying safe thanks to your system: There may not be a genuine pet escape detection feature, but there are motion triggers for your cameras. If your pet is an escape artist, you can mount the camera in the path of their typical route and get an alert when they attempt to use it. From there, you can intervene or call someone else to help round your doggie up. Hopefully, your family dog is faithful and defensive of your household. If a break-in was to take place, he would most likely go into a commendably defensive posture. That’s wonderful – however, it’s still not fair to put the safety of your whole family on your dog’s shoulders. What would be better? Letting your smart pet partner with your smart home security system to give your home multiple security layers. For questions about how to best pair up your pets and your smart home security, Staten Island homeowners can learn more by calling Alarmingly Affordable. We look forward to speaking with you. Steven is the owner and President of Alarmingly Affordable, a Staten Island security company focused on access control, video surveillance and other integrated systems for commercial, institutional, and residential applications. Does Your Staten Island Home Security System Need a Spring Makeover? Home Security: Why Wireless Keypads?